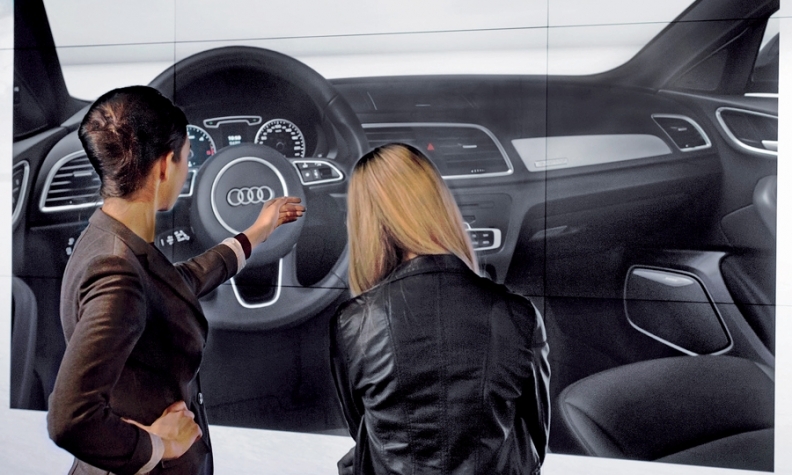 Audi City dealerships feature near floor-to-ceiling powerwalls and tables with high-definition touch screens for customers to configure their vehicles. LONDON -- The young couple from Chicago left the Audi dealership disappointed. They wanted an A4 but the car was out of stock and they couldn't order it. Still, the dealership staff proudly recounts the tale. Why? Because the dealership wasn't in Chicago but across the Atlantic in London. The Chicago couple wanted the A4 shipped from England -- even though they couldn't order it there because the store uses the U.K. ordering system, which has right-hand-drive vehicles -- because they were wowed by the dealership's showroom technology. The dealership, Audi City in Mayfair, central London, showcases a revolutionary new way for Volkswagen's premium brand to sell not just cars but the brand itself. Since the dealership opened in 2012 just before the London Olympics, the small, 4,600-square-foot store has created such a buzz that it has joined London institutions such as the Ritz Hotel across Piccadilly and the Fortnum & Mason food store farther down the street as stops for guided tours. "Tomorrow we've got three groups of 30 coming in," says Kasuni Vitharana, head of the dealership's specialist information team. "We don't mind the tourist groups, but we do appreciate a bit of notice." The dealership's star attractions are the four so-called powerwalls -- nearly floor-to-ceiling screens that display a customer's chosen car. The powerwalls, created from 36 backlit LED display screens almost seamlessly joined together, are linked to high-definition touch screens mounted on tables where cars can be configured. Consumers choose the model, color, engine and other specifications on the table, then swipe the screen to send the completed car to the wall. There they can spin it around, peer inside, open the doors and trunk and even watch it drive off, complete with authentic engine noises. As with the latest iPad interaction, commands are instantly and smoothly relayed. The effect is mesmerizing. Audi City London also has three so-called private customer lodges in the basement. A private customer lodge is among the special Audi City features. Vitharana's eight-member specialist team operates like BMW's Apple-inspired product Geniuses. Wielding iPads, they're there to inform and explain, but not to sell. "We help customers build the car the way they like it," she says. "It could be a kid building a dream car. It could be a customer. It doesn't matter." Audi City is an embodiment of Audi's tag line Vorsprung durch Technik (progress through technology), says Horst Hanschur, head of global network strategy. "Of our brand values, one is sophistication, the second one is progressive, and sporty is a third," he tells Automotive News. "With Audi City we think we touch all three." 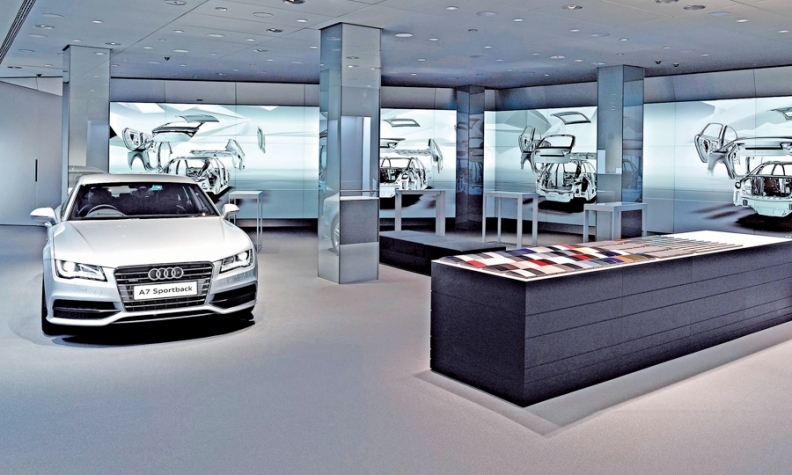 Other Audi City stores have since opened in Beijing and Berlin, and one is due to open this year in Moscow. The location of each store is crucial, Hanschur says. Each store must be in a central luxury shopping area popular with both locals and tourists. "We want to go where our customers are," Hanschur says. "Where they're in a good mood, where they want to shop, and when the wife and kids are there, too." Audi isn't the only premium automotive marque opening brand-building storefronts. BMW has just opened its second Brand Store in Brussels, two years after the first one opened along Paris' famous Avenue George V, just around the corner from the Champs-Elysees. Mercedes-Benz has similar outlets in 20 cities, including Tokyo and Milan, Italy. Mercedes said in March at the Geneva auto show that it plans to open 20 more by 2020. But so far none has the technology reach of Audi City. Powerwalls enable shoppers who have configured their vehicles to look inside the vehicles. They can even open the doors and watch vehicles drive off, complete with authentic engine noises. Audi City London has just four cars on display -- high-performance RS models plus one R8 supercar -- far fewer than a traditional dealership. But while other dealerships stock more cars, the chances of finding a certain model among Audi's vast range is slim. And the typical industrial-park location might be cheap to build on but "is not really where our customers live or want to spend a high proportion of their time," Hanschur says. According to Audi, digital technology has had a powerful effect. Sales at Audi City London are up 60 percent from the traditional Audi showroom that previously occupied the site, Hanschur says, without giving exact figures. He says that 70 percent of the dealership's customers are new to Audi. Raju Sailopal, Audi City London's head of sales, says the average price of cars sold at the dealership is about £8,000, or about $13,400, above the national U.K. average of about $43,000. He says only one in every four or five customers wants a test drive, compared with about half of customers in a regular dealership. Audi City London offers test drives, with cars sent from its service center a couple of miles away. Audi City London is a collaboration between Audi UK and Sytner, a Leicester, England, dealership group owned by Penske Automotive Group. Audi did not respond to requests about ownership stakes in the London dealership. Hanschur expects future dealers embracing the technology to pay for the hardware. "From time to time, we support a bit of the rent for shops on prime locations, but the dealer needs to have the heaviest burden of the cost," Hanschur says. In return Audi will supply the content. "A single dealer can't afford to produce the content," Hanschur says. "The content is centrally provided, at no additional cost." Amit Sood, the dealership's information technology lead, says Audi City London uses the modeling data that the vehicle designers used. "It's not particularly new," he says. "It's just never been customer-facing before." Dealers who find the perfect location for an Audi City are likely to be rewarded, says IHS Automotive senior analyst Tim Urquhart. "There is no doubt the format is an attractive and relatively cost effective option for urban locations, especially if you're trying to attract younger Gen Y-style customers," he tells Automotive News. So far in the United States, only Tesla with its network of stores in shopping areas has come close to replicating the high-tech inner-city outlets German premium brands are slowly rolling out elsewhere. In Manhattan, BMW used the same specialist luxury-shop architect that created the Brand Store in Paris. But the company said it didn't fall under the same banner, partly because the 11th Avenue location is a full-fledged dealership, much like Mercedes' nearby flagship outlet. "When it comes to buying cars in America, people tend rather to buy a car that they can drive out of the showroom, rather than made to order as in Europe," says Emma Begley, head of communication for BMW global sales. Audi City London might not have many cars on display, but the technology says something even more powerful about the brand, says head of sales Sailopal. He says: "It tells the customer that they're going to be looked after, that the car is high value, high technology and has got a lot of support behind it. If someone's put so much care into the showroom, what's their car going to be like?"